A few weeks back, when I posted John Wonderling’s original version of ‘Midway Down’, I started thinking about the Creation. I eventually found my way back into the crates, and dug out the 45 you see before you today. The other side of this record (‘Making Time’) saw the light of day in this space nearly six years ago, not long after I got my hands on it. 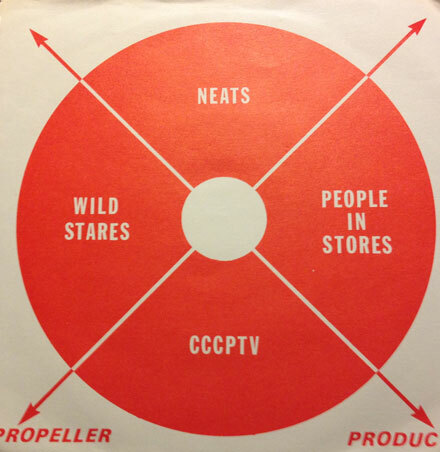 As I stated then, back in the garage/mod days of the 80s, the Creation loomed large with our set. 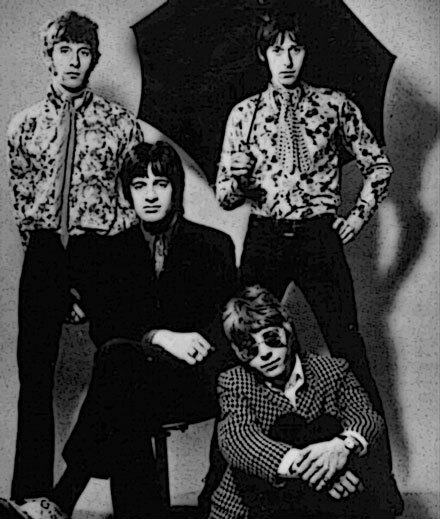 The subset of bands that intersected with the freakbeat vibe were a very big deal for us in that they covered the bases for the folks with a taste for pop, as well as those of us (often the same people) who liked things with a slightly harder edge. Though they were only really a going concern for two years (1966-1967) the Creation laid down some of the finest 45s of that transitional era. 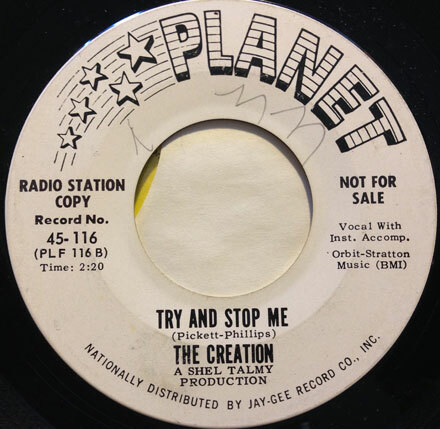 ‘Try and Stop Me’, co-written by Kenny Pickett and Eddie Phillips is pure pop, but it’s all laid atop some heavy, gritty guitars. The Creation are often compared – for fairly obvious reasons – with the Who, and when you sit down and listen to their records it is a favorable comparison indeed. I wouldn’t go as far as to suggest that anyone in the Creation had the creative reach of Pete Townshend, but for pure listenability, they were right up there. Sadly, the Creation never had the kind of success that their music deserved, only charting twice in the UK (with Making Time and Painterman, both in 1966), though they had more success on the Continent. 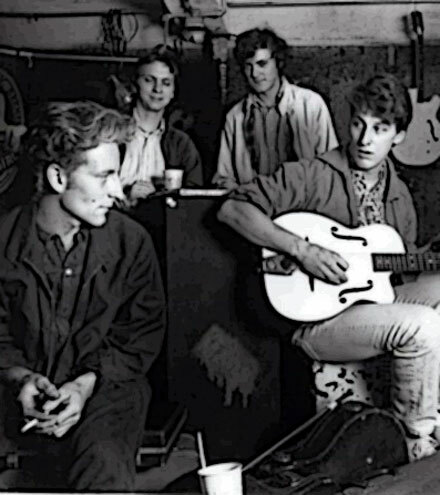 Fortunately for everyone, the Creation’s recordings have been available in reissue fairly steadily since the 80s (you can even find them on iTunes!). We have some groovy new arrivals in the playlist this month, including some prime freakbeat, West Coast Sunshine Pop/Flower Power, pure pop, freakout, UK Folk Rock and a tribute to the late Phil Everly. I had something else in the on-deck circle for this week, but then over the weekend the word came down that Phil Everly had passed away at the age of 74. The Everly Brothers were featured in this space almost exactly five years ago, with their original version of ‘Man With Money’, a song that had become a minor Britbeat standard at the hands of the Wild Uncertainty, the Who and the Eyes. I have to admit that I took the Everly Brothers for granted for a long, long time. They were a fixture on oldies radio, and I knew (and sang along to) songs like ‘Cathy’s Clown’ and ‘Wake Up Little Suzie’, but it wasn’t until I started to get into older country sounds, especially the Louvin Brothers (a big influence on Phil and Don), that I started to understand how important the Everlys were. Taking off from a simple artistic appraisal, their closely woven harmonies and songwriting were both remarkable, and important parts of the country-influenced side of the early rock and roll era. It was almost impossible to figure out where one voice began and the other one ended in their recordings. 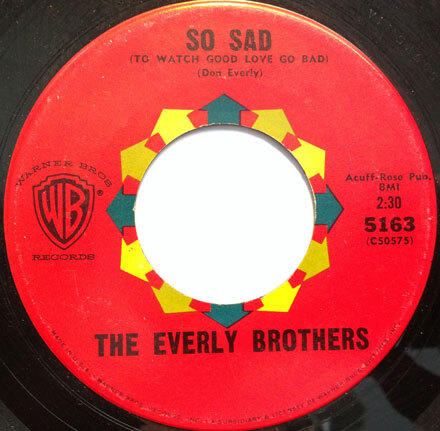 Starting in 1957, with ‘Bye Bye Love’ and their last flirtation with the charts ten years later with the fantastic ‘Bowling Green’ (also recorded by the Gosdin Brothers) the Everly Brothers were a huge part of the ‘classic’ era, and continued to innovate through the Beat group era, on which they were a huge influence. 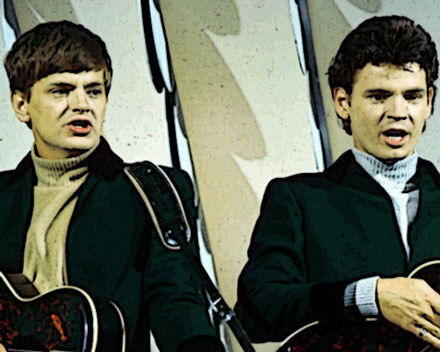 You can’t listen to the harmonies of groups like the Beatles, Hollies, the Byrds and Simon and Garfunkel without hearing the echoes of the Everly Brothers. Though they peaked fairly early, they continued to record and innovate through the 60s, making excellent forays into rock and country rock sounds. The two tracks I’m featuring today are from the period after they moved from Cadence (where they made their mark) to Warner Brothers. 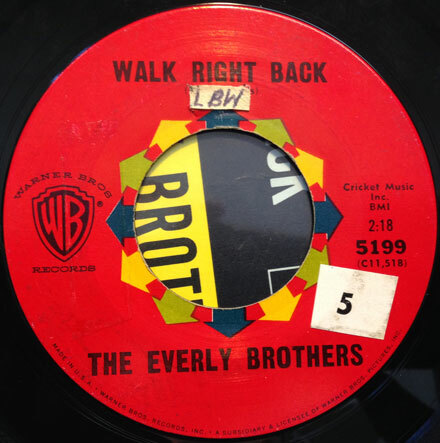 ‘Walk Right Back’ was written (but not completed) by Sonny Curtis, who was in the Army at the time. He brought the incomplete song to Hollywood and played it for the Everlys, who supposedly told Curtis that they would record it if he would write a second verse. He went back to camp and wrote the verse, only to discover that they had recorded the song already, repeating the existing verse! The song was a Top 10 hit in the US and made it to #1 in the UK in January of 1961. 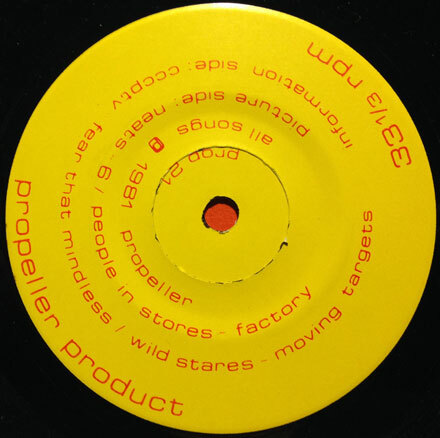 It was originally issued as the B-side of the 45, but eventually flipped over. Oddly enough, I first heard (and fell in love with) the song ‘So Sad (To Watch Good Love Go Bad)’ via the 1969 version by (Doug) Dillard and (Gene) Clark. It was only later on that I discovered that it was an Everly Brothers song, written by Don. The Everly Brothers version was actually a two-side hit in the summer of 1960, with its flip, a cover of Little Richard’s ‘Lucille’ charting simultaneously. Though their popularity waned a bit in the US, the brothers placed a string of records in the UK Top 40 (including making it to Number 2 with ‘The Price of Love’ in 1965). They continued to make interesting albums like ‘Beat & Soul’, ‘Two Yanks In England’ ‘The Everly Brothers Sing’ and 1968’s ‘Roots’. The Everly Brothers continued to record as a duo before breaking up in 1973. That year Phil would record a remarkable cover of an obscure Albert Hammond song, ‘The Air That I Breathe’ arranged by Warren Zevon and produced by Duane Eddy, that the Hollies would pick up and rerecord the following year to huge international success. Phil Everly’s recording of the song is truly beautiful and ought to be much better known. The Everly Brothers reunited in the early 1980s, and continued to tour together for many years. The brothers were among the first inductees into the Rock and Roll Hall of Fame in 1986. I hope you dig the sounds.